The image above is a stunning view of a well known and important feature of Darling Harbour – Pyrmont Bridge. Yet many people who may cross this bridge on a regular basis have no idea of the extraordinary history of the bridge, or indeed that it is one of the worlds oldest surviving and working swing bridges. The first Pyrmont Bridge was built in 1857 and made entirely of timber. Just like the current and second bridge, the first bridge had a swing span which allowed ships which would otherwise be to tap to enter Cockle Bay which was then a busy port. In 1891 a competition was held to decide on a design for a new Pyrmont Swing Bridge, but the winning entry, built entirely of metal, was deemed far too expensive to actually build. Instead, a design by Robert Hickson, the Commissioner and Engineer in Chief of the Department for Public Works was adopted. His design was for a bridge built mainly of timber, but with an iron swing span which was supported by a central pier when opened, and two additional piers when closed. Construction on the bridge began in 1899 and the new bridge, complete with an electrically powered swing span (one of the first in the world) was opened in 1902. The bridge was finally closed to traffic in 1981 and was almost demolished following this closure. Thanks to the intervention of various organisations and the public itself though, the bridge was saved and in 1988 was opened to pedestrian traffic. This week, The Past Present has decided to turn attention north of Sydney, to this stunning postcard image of Gosford, on the Central Coast of NSW. Gosford has long been a popular destination for day trippers and holiday makers from Sydney, yet as this image shows, Gosford was not always the city it is today. Although today Gosford is the administrative centre of the Central Coast, with a growing city to match, Gosford was not always the coast side metropolis we see today. European colonisation of the Gosford area did not begin until the mid 1820s, because although the area had been explored within years of the colonists arriving, it was too difficult to access. The soils were rich though, and agriculturalists soon began to move into the area. By 1850 there was a cart track between the Hawkesbury River and Brisbane water and by the end of the 19th century the area was abounding in market gardens and orchards, particularly citrus orchards. 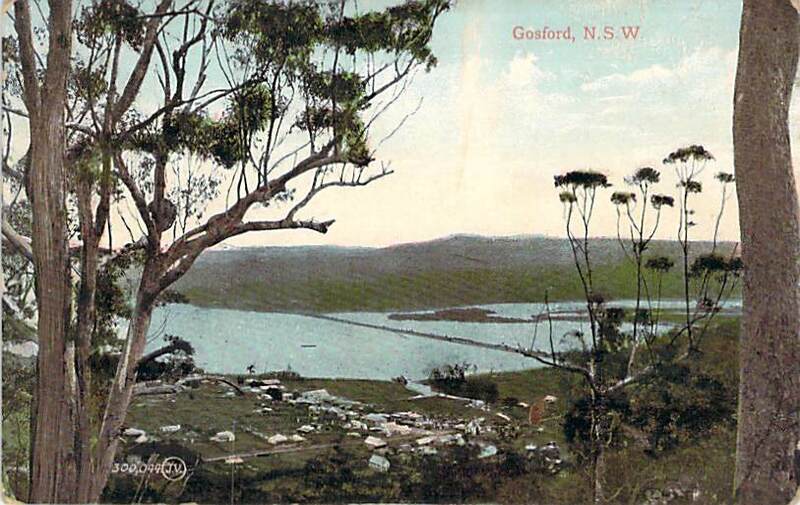 Gosford itself was named in 1839 after the 2nd Earl of Gosford, Archibald Acheson in 1885 Gosford was officially declared a town, with the declaration of a municipality following a year later in 1886. Yet it was not until the rail link was completed between Sydney and the area in 1887 that settlement really began to accelerate. Even by the 1920s, Gosford was still simply a small town, though it had already grown a reputation as a popular tourist resort. When the Pacific Highway was opened in 1930, settlement in the area rapidly expanded, slowly but surely creating the Gosford we know today – a thriving coast side city. This week, with the weather continuing to be so wet and dreary, it seemed a perfect time for The Past Present to examine the image above. Audley Weir in the Royal National Park is a popular place for visitors and tourists with boating, fishing and bushwalking being popular pursuits. Yet the weir also acts as a river crossing, and during times of extended or heavy rain, the river rises and floods the road, sometimes closing it entirely. European explorers visited the area which now encompasses the Royal National Park in the early 1800s, but they reported that the land was not favourable for settlement due to rough terrain. As a result, although there were small settlements which sprung up around the fringes of todays park, and at Wattamolla by the mid 1800s, most of the land remained untouched bush. In 1879 the area was dedicated as a National Park, which was also to be used to acclimatise exotic species for the NSW Zoological Society, which had been formed just a few days previously. The trustees planned to create ornamental gardens, exotic plantings, a zoo and even a race course, but many of these plans never eventuated. However, the main focus of recreation within the park was to be Audley, and soon a holiday camp with a number of buildings was constructed. By May 1881 the camp, which was named Audley three years later in 1884, included a boathouse, jetty, cottages, a pavilion, stables and even a smithy! The causeway itself was completed in 1883 and served two important purposes. Not only did it provide access to the other side of the river, but it created a permanent body of freshwater which could be stocked with fish and also used for boating and bathing. 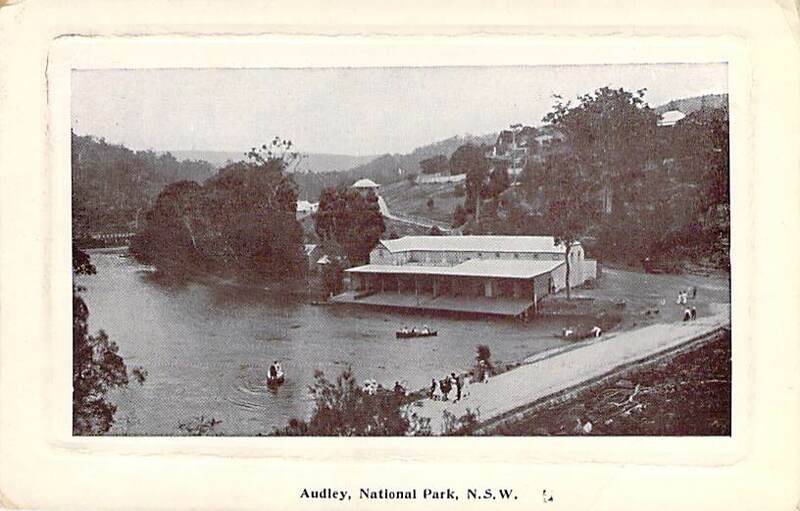 A new boat shed, also shown in the image above, was soon built to encourage boating in the area and soon tourists were flocking to Audley for a day out and about in the fresh air and beautiful Australian bush. Fishing and boating remain popular pastimes at Audley to this day. The image above is an amazing glimpse into the history of a part of the city which most, if not all Sydneysiders would be extremely familiar with, Martin Place. Yet the Martin Place we know today is a vastly different scene to that in the postcard above. Although still bustling with activity, today Martin Place is a haven for pedestrians, and gone are the rows of cars which once lined up along the street. In it’s earliest incarnation, Martin Place was a far cry from the broad street we see in the image above, let alone the grand pedestrian mall we know today. Martin Place began life as a humble, narrow laneway connecting Moore Street to Pitt Street. There were plans to open up the Northern side of the grand new GPO building, but these did not eventuate, at least not until fire destroyed most of the properties which fronted onto the laneway. The fire allowed a wider street, called Martin Place after Sir James Martin, to be built, though the street remained extremely short. Then, in 1921 Moore Street was widened and also renamed Martin Place, extending the existing street quite significantly. Further extensions were made over the following years, and eventually, when these were completed in 1935, Martin Place ran the full length between Castlereagh Street and Macquarie Street. Yet Martin Place was still a very different place to what we see today. The street was, like today, filled with thriving businesses and businessmen, with most of Sydney’s financial and insurance businesses centred on the street. The street was also used as just that though, a street, complete with cars and, in the image above, even a horse trap! Martin Place would not be redeveloped as a pedestrian mall until the 1970s, with the pedestrian plaza completed in 1979. This week, with the weather so unpredictable and so many storms about in recent days and weeks, it seemed the ideal time to share this image of Dunbar Rock in South Head. Sydney, and Australia more generally, with its abundance of coastline, also has an abundant and tragic history of shipwreck and loss. The loss of the Dunbar, which happened off the coast of what is now known as Dunbar Rock at The Gap, remains Australia’s worst peacetime maritime disaster. The Dunbar was, at the time of its launch, the largest timber ship to have been constructed at the Sunderland dockyards, and was constructed as a response to the demand for passage to Australia and the booming gold fields. Yet it was not until 1856 that the ship began to ply the route to Australia, as before then The Dunbar was deployed as a Crimean War troopship. The wreck of The Dunbar happened within a year of this, occurring on the night of the 20th of August, 1857. The ship, which was on just its second trip to Australia, was approaching the entrance to Port Jackson in the midst of a violent storm. The Dunbar was driven by the storm into the cliffs of South Head, just near Dunbar Rock, and rapidly broke apart. Of 122 passengers and crew aboard, only one survived, Able Seaman James Johnson. The disaster was later blamed on insufficient navigational aids, and in response the Hornby Light at South Head was constructed. Yet the Hornby Light is not the only reminder of this tragic shipwreck. On Dunbar Rock itself, there is an anchor which is believed to come from the wreck of the Dunbar, and was retrieved in 1910. There is also a rock cut inscription which commemorates the terrible wreck, and which is actually believed to have been first carved by an onlooker watching the tragedy unfolding. This inscription was later recut, probably on an anniversary of the shipwreck.